The guitar is assembled and all alignments checked, which ensured a good set-up. The neck trussrod tension nut has been being adjusted 1/8 turn per day with relaxed strings, starting 5 days ago. Today's inspection and ops check showed the relief correct and good for overall playing techniques. The bridge saddles and parts were reassembled and the bridge registered into position and installed. A complete ops check and initial setup was done by playing the guitar for about an hour. WHAT A JOY ! With all alignments and initial set up found and ensured; The neck was removed for shimming the neck pocket mounting screw holes (the neck moves in it's pocket due to loose neck screw holes in the guitar body). This was done with a nest of flat toothpick shims around the entire perimeter of the holes and held and pressed into place by running the mounting screws into the holes. The neck was reinstalled upon the guitar. It is now nice and tight. The last fret was faced / dressed down slightly as it was a tad bit too high. 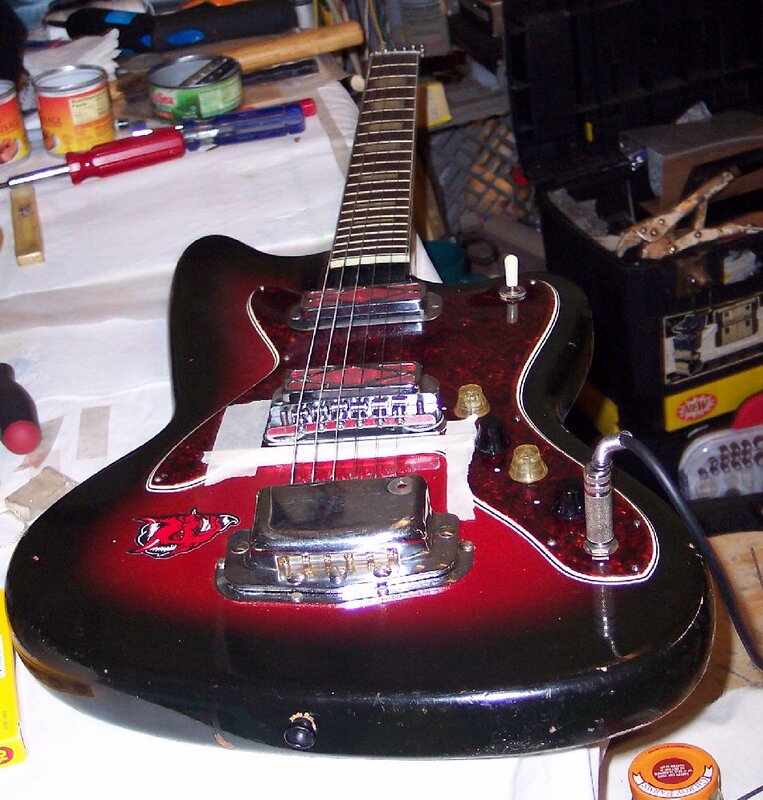 A strings ground wire was fabricated from a piece of guitar 1dy string which was formed into a coil and run from under the rear pickup bezel to under the bridge base. When the fingers touch the strings, the body ground communicates to the electronics through the bridge, the coiled wire and into the pickup base plate the coiled wire is now located under. 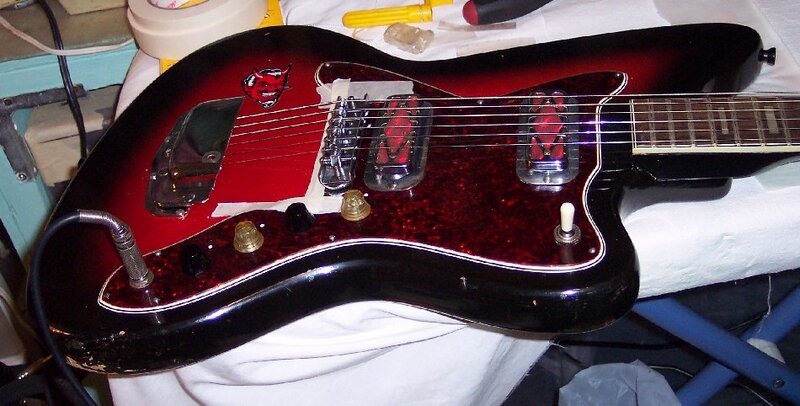 Harmony did not provide a strings ground wire for their electric guitars (high amp gain had not become mainstream back then) and of course single coil pickups can get noisy without a strings ground, particularly when playing with high gain or with volume controls below wide open. The strings are now grounded as said here. There are a few lubricating items remaining before stringing the guitar for final set-up. The joyous fun will begin in final setup by playing the guitar along with backing tracks during and after final setup. I look forward to that experience and victory after having this Rascal try it's best to beat me ....or make it seem that way to achieve what it's due. 1 day's work on the guitar case is to also be done. Work checklist can be viewed HERE in a separate window. Masking tape marking the exact position of the bridge's correct datum register will be kept on until the final setup is done, to make sure that the datum register is kept just in case any adjustments have to be done and determining the exact datum will not have to be re-established.